Premium Kiln Dried Hardwood Logs supplied by Logs 2U, the country’s leading log suppliers and wood fuel delivery specialists have experienced such high demand for logs and firewood that they have stepped up production to "full capacity" at the company’s wood drying production plant in the last few weeks. 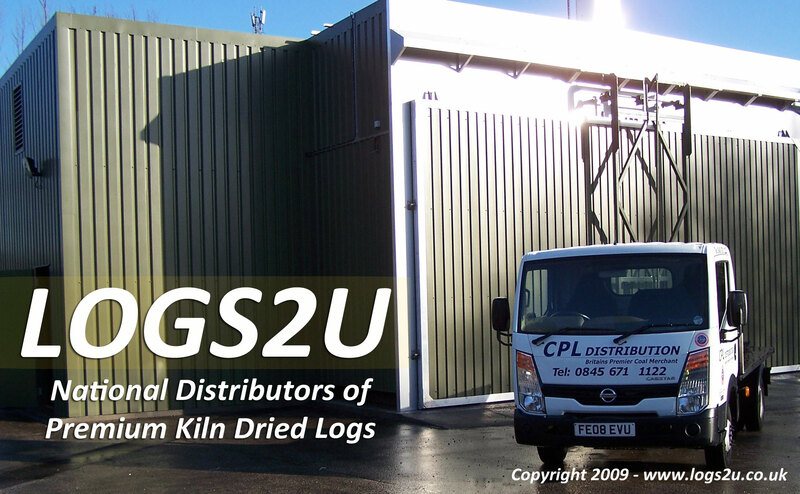 UK's largest capacity to Kiln Dry Logs and firewood each and every week! Logs 2U's Wood Drying Kiln is now in operation 24/7. The kiln enables Logs 2U to further capitalise on the growing online demand from UK householders who are increasingly turning to sustainable sources to heat their homes, reflected by the huge increase over the past two years for sales of multi-fuel and wood burning stoves. Logs 2U launched their national log and firewood delivery service online with their dedicated website in 2009 and quickly found a ready market for logs and firewood alongside brand leading smokeless fuels such as Homefire and ecoal. Recognising that there is limited supplies of well-seasoned hardwood Logs in the UK and anticipating high demand during the winter season the company took the decision last year to invest over £300k in what is now believed to be one of the UK's largest wood drying kiln production plants, making Logs 2U the country’s foremost national supplier of Premium Kiln Dried Logs and Premium Kiln Dried Firewood. Production quality standards ensure that moisture content is driven down from above 35% to under 20% before the logs and firewood is packaged ready for national distribution . This new 24/7 production capacity facilitates fast deliveries and an all year round supply. The advantages of using Kiln Dried Hardwood Logs are numerous; not only are they one of the most efficient and environmentally sound heating fuels (considered as carbon neutral) their advantages far outweigh those of unseasoned logs. Kiln Dried Logs and Firewood is ready to use immediately and due to their low moisture content they burn very hot. Less energy is used to drive out moisture leaving more energy to be converted into heat ultimately creating a drier fire. The high temperatures generated when burning Logs2U Premium Kiln Dried Logs also means that everything is burnt, even the gasses released by the wood, which subsequently produces less smoke and much more heat. The higher temperatures and efficient burning means that consumers actually use less logs to generate heat for their homes, making Logs2U's Premium Kiln Dried Logs exceptionally good value for money. For the thousands of households who choose to use multi-fuel stoves and wood-burners in favour of other less eco friendly heating appliances, burning kiln dried logs not only prolongs the life of their appliance (and flues / chimneys') but also helps validate the manufacturer’s warranty. The higher temperatures generated when burning Logs2U Premium Kiln Dried Logs burn off residual moisture and sap remaining in the wood which stops it from building up on the inside of the appliance or flue as tar condensates. These sticky tar condensates can, over time, foul and rust the appliance leading to loss of efficiency and a shorter lifespan and in a number of cases they can be the prime cause of devastating chimney fires - All the more reason to burn wood fuels at the highest possible temperatures. Premium Kiln Dried Hardwood Logs are now available from Logs 2U in either 1m3 Dumpy Bags, in 0.1m3 Handy Bags, or in Dinky Bags of approximately 0.03m3. Bulk buyers can also take advantage of Logs2U's special money saving discounted offers through a number of bulk buy and pallet delivery buying options available on their website. The Handy Bags are a new innovation and are proving extremely popular with customers as they combine good value for money, whilst being small enough that they can be delivered next to your log store. 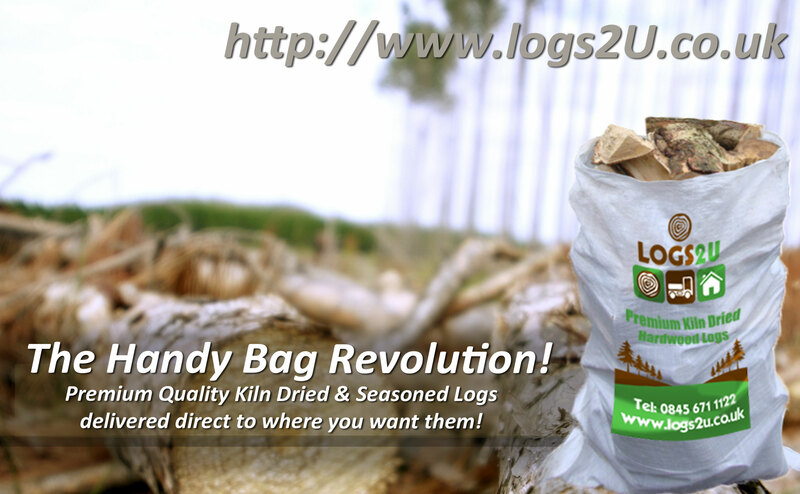 Currently, Logs 2U are giving a Winter Discount Promotion of 10% off Kiln Dried Handy Bags. 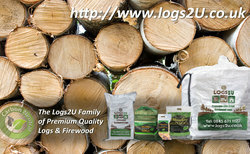 See the Logs 2U website for ordering or contact information. Logs 2U’s range now consists of Premium Kiln Dried Hardwood Logs, seasoned hardwood logs, low cost unseasoned logs in nets, eco logs, softwood logs, ultra dry kindling, log stores, heat logs and for those who like to plan ahead and make cash savings - unseasoned hardwood logs can also be purchased cheaply by those who wish to season their own logs. Logs 2U offers one the most comprehensive national home delivery services in the UK today providing a highly personal, friendly and professional service. "Kiln to door" deliveries are between 4 - 6 working days from orders being placed. Logs 2U is the UK’s leading national distributor of firewood and logs with over 30 depots throughout the country supplying a complete range of wood fuels. Logs 2U is owned by CPL Distribution Ltd which was formed by the merger of two of the UK's longest established and most widely known fuel companies, Charringtons and British Fuels and now have over 30 depots throughout the UK supplying a complete range of wood fuels and solid fuels to households, commercial outlets and industrial customers. Manufactured solid fuels are HETAS approved where appropriate. (Independently tested and passed fit for purpose and include smokeless fuels for open fires and multi-fuel stoves, cookers and boilers). Logs2U also supplies a wide range of logs, firewood, log stores, heat logs, firelighters, kindling, fireside accessories, fireguards, axes and fire logs. Wood products are produced and sourced from well-managed UK woodlands.